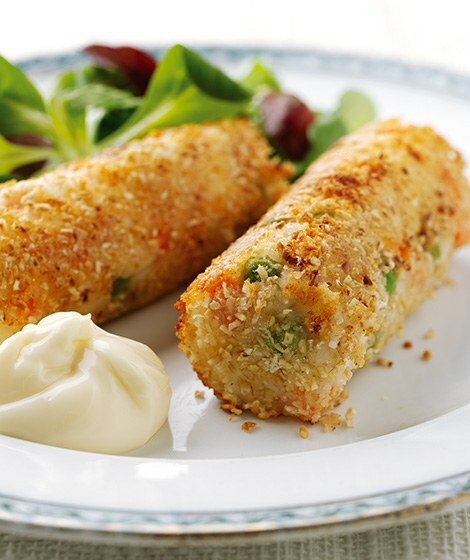 These easy retro-style croquettes are great with chicken or fish. Cut the potatoes into chunks and place in a saucepan of cold water. Bring to the boil and simmer for 10 minutes until tender. Drain and allow to cool completely. Meanwhile, boil the carrots and peas for 3 minutes. Drain and run under cold water. Mash the potatoes, stir in the cottage cheese and vegetables and season well. Divide into 8 and mould into cylinder shapes. Sprinkle the oatmeal onto a large plate and roll each croquette in it to evenly coat. Heat a little oil in a large frying pan and fry the croquettes for 5 minutes, turning occasionally until golden. Serve with low fat garlic mayonnaise and salad. Try using frozen mixed vegetables instead of peas and carrots.